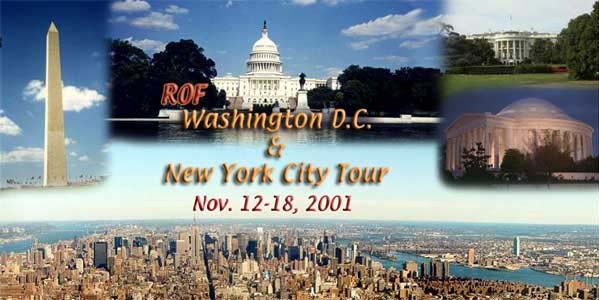 On Nov. 12 Ring of Fire leaves on their first tour of the season for Washington D.C. and New York City. With sightseeing planned for both cities and 5 performances scheduled, this will be a busy trip. The group flies into Baltimore, MD on Monday evening, Nov. 12. On Tuesday, they head to New York City for two days of sightseeing in the Big Apple, giving the ringers a hands-on education they won't find at home. On the way to NYC, the group hopes to visit the handbell manufacturer Malmark, Inc. headquarters in Plumsteadville, PA. 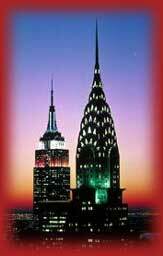 In NYC, the ROF hope to see such famous sites as the Empire State Building, Central Park, Times Square, Statue of Liberty (if open) and "ground zero" where the World Trade Center terrorist attacks took place. On Thursday, Nov. 15 the group will be in Fort Myer, Virginia to practice with the US Army Orchestra. 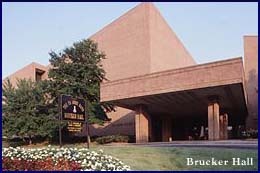 Later that evening, the two groups perform in concert at Brucker Hall located at Fort Myer. (For those going to this concert, please see the separate security instructions for getting on the base.) The two groups will each perform separately but plan to perform one or two songs together, including the well known "Battle Hymn of the Republic." Friday, Nov. 16 ROF tours Washington, DC during the day, trying to take in such sites as the famous Washington and Lincoln monuments on the mall, some of the Smithsonian museums, and the Bureau of Engraving and Printing where US currency is printed. Then in the evening, ROF performs for the 1st annual Adventist Healthcare Conference at the General Conference Headquarters of Seventh-day Adventists in Silver Spring, MD. They are providing the music for the Celebration of Thanksgiving starting at 7:30 pm. Saturday, ROF performs at two morning church services, one at the Sligo SDA Church in Tacoma Park, MD at 9 am and then at the Spencerville SDA Church in Silver Spring, MD at 11 am. In the afternoon, they drive back to NYC, to prepare for Sunday's performace. Sunday morning ROF performs at St. Patrick's Cathedral for their 10:30 am church service. Saint Patrick's is the largest Catholic church in the nation and located on 5th Ave. in downtown NYC. Monday the group flies back to Portland. We welcome and greatly appreciate any and all donations to help offset the expenses of going on tour. The US Army Orchestra is the US Army's music representative for the US State Department and Department of Defense, playing for distinguished visitors to the White House and other special governmental occasions. The General Conference is the world headquarters of the Seventh-day Adventist Church. With over 11 million members worldwide located in 206 countries, it is one of the fastest growing churches in the world. St. Patrick's Cathedral is in the heart of downtown New York City on 5th Ave. With it's Gothic architecture, it presents a striking and impressive structure in stark contrast to the modern sky scrapers that surround it.